Charley Chau blankets now available through Fetch, the pet store from Ocado! We're absolutely over the moon that Charley Chau blankets are now available on Fetch (www.fetch.co.uk), the pet store from Ocado! Many people know Ocado because of their deal with Waitrose but in 2013 Ocado launched Fetch as their first stand-alone website, focusing entirely on pets! Charley Chau is the first luxury dog bedding brand to be stocked by Fetch, broadening the range and quality offered to Fetch’s customers. Fetch now stocks Charley Chau’s fabulous Double Fleece Blankets, Faux-Fur Blankets and our lovely Faux-Fur Fleece Comforters. You can also view the range of Charley Chau Luxury Blankets on Fetch. 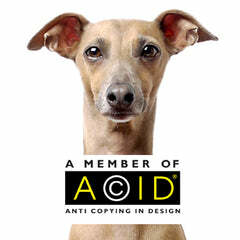 Charley and Theo (two of our Italian Greyhounds) are particularly excited as they now get to star on the Fetch website! Theo is jolly pleased about being a pin up on Fetch! Why not pop over to Fetch and take a look? And, if you shop at Ocado, they will handily combine your orders so you could have one of our beautiful blankets delivered for your dog with your weekly shop! We're so incredibly proud to have been chosen by Ocado to supply the Fetch website. When Fetch approached us we were totally gobsmacked! Who would have thought just over three years ago when we designed and launched our Snuggle Bed that we would be picked up by such an amazing online retailer! Fingers crossed that Fetch and Ocado customers love our collection of stylish blankets!